Alpha Computer Group’s IT Support and Managed Service Provider for Small to Medium Businesses all around Long Island, we understand that reliable IT services are essential for your business. Our team of certified experts provide high-quality Long Island IT support, including the following features and benefits. Our team of experts works with you to develop a cohesive technology support plan specifically designed for your business. Our fully staffed Network Operations Center provides full maintenance services and support ranging from desktop support, business continuity, disaster recovery, remote and on-site support, proactive network monitoring and ongoing maintenance services. Our proactive 24/7/365 IT service, combined with our guaranteed on-site response times provides our customers with peace of mind and allows them to achieve their specific business initiatives. Alpha Computer Group’s support team consists of a fully-staffed, in-house team of IT professionals with a wide range of experience and certifications. Our staff is made up of smart, dedicated, professional and enthusiastic individuals. Our IT team is our most important asset, which is why, as a company, we invest in these individuals’ professional growth through continuous education and certification programs. Our Network Operations Center (NOC) is powered with the latest technologies, diagnostic tools, and monitoring solutions. This provides for a more proactive approach and responsive support model to meet our client’s individual needs. We provide flexible, customized solutions and service offerings. No matter the size or type of business, we have technology solutions to meet your unique business needs. Whether it is a supplemental service request, a complete managed IT package, or nationwide deployment, we provide the necessary resources to allow you to remain competitive and profitable. To get long-term value out of your IT, you need to make sure it runs smoothly at all times. But the burden of managing IT isn’t getting any easier; in fact, it can be extremely time-consuming without the help of highly-trained technicians. Alpha Computer Group’s IT support services dedicate computer experts to eliminate your technical headaches. We constantly measure delivery processes and set performance standards because we truly believe this is a differentiating factor that enables our collective businesses to thrive and grow. Ensuring the best possible operation, your IT servers are constantly monitored and managed by Stratosphere Networks’ experts. Enabling businesses to stay cutting-edge, our staff can satisfy your rapidly growing needs and technology requirements. We will quickly address any server upgrade or malfunction so your business can run seamlessly, with minimal to no downtime at all. We provide state of the art, around the clock monitoring and support for your network environment. This means that no matter what happens we will be the first ones to know, and begin addressing the issue immediately. Our support provides you with the extra layer of security and stability that you need. Whether it’s a basic issue or a major disaster, Alpha Computer Group has you covered. Our in-house team of smart and driven IT professionals have various levels of experience and hold a number of different certifications, such as Microsoft, Cisco, Citrix, HP, and Apple, among others. We have Level 1, 2 and 3 engineers on staff to ensure we can efficiently meet all of our clients’ business needs. Our Network Operations Command Center leverages cutting-edge technologies, monitoring tools and diagnostic solutions to provide proactive and highly responsive support. Alpha Computer Group offers flexible, customized solutions and service offerings to meet your unique business needs. We’ll provide you with the support you need to achieve success, whether it’s a complete managed IT package or supplemental service request. Our comprehensive Long Island IT support services include unlimited access to courses at our customer training center to help our clients stay up to speed on products and services. With our 24/7/365 proactive monitoring services and live help desk, our clients can count on immediate responses to any issues. It’s incredibly rare that a client would leave Alpha Computer Group for a competitor. We’re a tough act to follow! Nearly half of our client base switched to Alpha Computer Group for managed services from another provider. We think that says something unique about our approach. We’re experts at configuring and managing infrastructure because we’ve done it day-in, day-out for more than 300,000 devices and counting. Alpha Computer Group monitors your IT environment so you can worry about running your business. With a customer satisfaction rating of 5.0 out of 5, we take pride in keeping your employees happy 24/7. Alpha Computer Group is the only top globally-ranked MSP to be 100% dedicated to supporting Long Island businesses in Nassau County & Suffolk County. As more than just a service provider, we aim to be a trusted partner. From trading firms to law offices and everything in between, our clients expect the best—and we deliver. Alpha Computer Group provides top of the line managed services to Organizations. Whether it’s a small problem or a data center migration, we have you covered. With all the different types of services that we provide, you can benefit from our highly talented professionals who take the utmost care in giving the best customer service to our clients. Many businesses see IT consulting services as providers of broad strategies and theory only. It is worth highlighting the aspects of consulting that deal primarily with technology selection. In other words, your unique business should have an equally unique solution! With our managed services, you can stay on top of your IT needs and utilize the most out of your infrastructure, the smart way. Managed services involve out-sourcing day to day I.T. operations to an outside service provider. Out-sourcing your day-to-day I.T. operations gives business leaders and I.T. administrators the opportunity to focus on other projects and long term business strategy. Alpha Computer Group’s managed services include remote and on-site support options for our clients. Our managed services come with customized service level agreements which provide administrators with expected response times and issue tracking in-case of any issues related to their networks. Our customized IT solutions and help desk IT support can help your business compete in today’s evolving and global market, at a fraction of the cost of employing an in-house IT support team. While our flexible network services and expert IT consulting allow you to focus on your business instead of the technology you need to keep it running. If you’re going to invest time and money in business technology, give Alpha Computer Group the opportunity to take the worry out of your IT decisions. Get a full service 24/7 IT department that works with you to improve how your business integrates with technology. We can help you save money by making sure that your data, servers, computers and phones are up and running. If you have ever had to halt business operations or pay an unexpected technology repair bill because a computer or server in your office broke, you know how expensive technology problems can be. We are able to keep your systems monitored and have live technicians right here in America standing by to help you with your problems 24 hours a day, 356 days a year. Keeping your business running smoothly is a challenge with today’s rapidly changing technology, so Alpha Computer Group’s proactive monitoring tracks problems before they happen. Real time alerts instantly notify technicians of any potential issues in your environment. Our technicians are able remote into any device on our coverage plan and solve 90% of problems. Avoiding problems means you are back in control of your time and budget, making both employees and business owners happy. Contact us today to see how managed IT services for Long Island can help your business. Many technology consulting firms and Managed Service Providers have specialties, so you need to understand their services focus. You don’t want a consulting firm centered on backup and disaster recovery services to work on mobile device support. 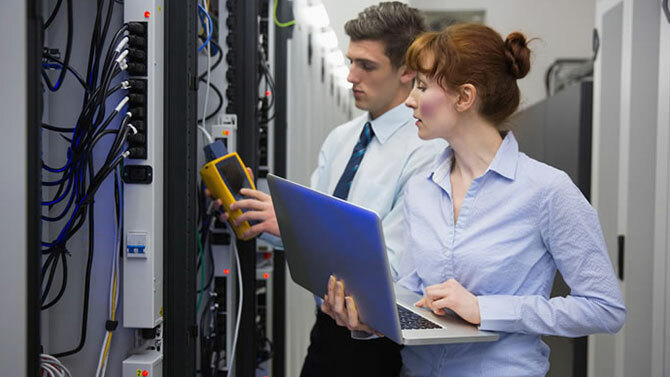 IT environments today are so interdependent and interconnected we recommend the IT consultants you select have a broad range of experience in many disciplines. IT consultants that bring the most value are those with actual operating experience. Synoptek has 20 years consulting experience. We currently operate and manage thousands of devices for over 3,000 clients. It is this “depth and breadth” of skills that deliver more value to our consulting clients. Don’t be limited by selecting IT consultants with limited expertise. Through a comprehensive IT consulting assessment we identify key business and IT criteria developing a strategy to simplify your information technology environment and lead the way to a more cost-effective and reliable IT infrastructure. Our progressive solutions enable companies to grow their businesses for improved business results, taking a customer-first approach in everything we do. Our IT consultants will leave you informed and ready to make the right choices at a cost that fits your budget. We offer a complete range of business technology services fueled by proven methodologies, process optimization and best practices. Whether your organization is feeling the pressure to boost productivity or level out unplanned IT costs, we will partner with you to create a roadmap for tomorrow. At Alpha Computer Group, our IT Services are based on great customer service. We want you to feel like we are your internal IT department. Let us take care of every aspect of your business technology. Alpha Computer Group’s IT Managed Services enables you to place resource-intensive IT operations under the management of experienced specialists from Alpha Computer Group so you can optimize existing resources and focus on your business. With a Managed Services contract, you don’t have to worry about who you should call for any different IT problem. You just call one dispatch number, and let us sort it out. We will manage all the different vendors and get you fixed and back up and running. Reliability. Trust. Security. These three terms are of most importance when it comes to an office environment. Alpha Computer Group is one of the top it companies in Chicago and has the proper tools and experience to support all of your office needs and wants. No matter the size of our clients, every office big or small, receives that same high quality support Alpha Computer Group is known for. Your business network is the backbone of your operations. You need all of your hardware and devices to run in sync. Alpha Computer Group has the tools to keep your network up and running. We can set up your network and hardware and make it perform to your standards. With our remote services we can keep a close eye on your network and fix problems before they happen. Alpha Computer Group can help setup, repair and expand your computer network. Let SolveMyPC design the proper reliable network that meets and exceeds your organization’s goals. Many companies designate an employee or even an entire department to manage their IT services. However, choosing an outside company to manage and consult regarding information technology gives companies an outside point-of-view on various decisions that are often overlooked internally. Alpha Computer Group is staffed with only the best IT professionals that focus on helping businesses around the New York area maximize their technology. Our IT professionals will work closely with you to analyze your company’s goals, then create and implement an effective IT plan to meet them. As part of our information technology consulting services, we’ll work closely with you to determine the main challenges facing your business. Then, we’ll uncover areas your IT services can improve and create and implement our streamlined solutions to address your business’s obstacles. If our initial solutions are not as effective as you need, we’ll re-evaluate and optimize them to better meet your needs. Contact us today @ (877) 608-8647 to learn more about our IT consulting services and processes today!